There is something very American about a Windsor chair. Although its name points to England, where the chair’s style and manufacture emerged in the early 1700s, this immigrant furniture found its way into every American home, from a restful rocker in a small Yankee farm house to the seats of the Founding Fathers in Philadelphia’s Independence Hall. The chair’s simple design made it relatively easy to build and affordable to buy. 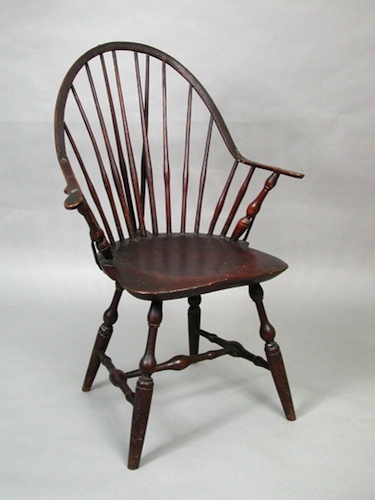 In the 18th and early 19th centuries both large and small Connecticut workshops employed apprentices and indentured servants, who often created the separate chair parts in large batches and built the chairs in an assembly-line fashion, cutting cost and time. A typical shop would have a bin full of chair-back spindles, for example, ready to add to a finished seat. On display in the Connecticut Historical Society’s Making Connecticut exhibit are a number of Windsor chairs from the Allen shop in Windham, Connecticut. Amos Denison Allen (1774–1855) owned a 190-acre farm and ran a shop that employed as many as 12 apprentices at one time. Allen began his career as an apprentice himself at the age of 16, working under contract for a furniture maker in Lisbon, Connecticut, beginning in 1790. Windsor chairs were shipped up and down the East Coast and transported locally by peddlers on horse-drawn carts. Allen shipped his Windsor chairs to his brother-in-law and agent in Savannah, Georgia. For large shipments, the chair parts were often packed separately to save space. Allen painted his chairs the typical colors of green, yellow, red, black, and brown. Some of the Windsor chairs in the CHS collection appear black today because the green paint has actually darkened over time. Kassay, John. The Book of American Windsor Furniture: Styles and Technologies. Amherst, MA: University of Massachusetts Press, 1998. Evans, Nancy Goyne. Windsor-Chair Making in America: From Craft Shop to Consumer. Hanover: University Press of New England, 2006. Swan, Christopher. “Going Green in the Eighteenth Century -- Understanding Original Windsor Furniture Color.” Antiques & Fine Art Magazine, 2014. Link. One-Legged Stools – Who Knew?